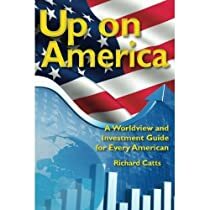 Up On America: The United States Leadership Position and Future in the New Order of the World by Richard Catts tackles and explains the economic and social strengths in America, America’s role in the world economy, and the country’s true standing in a new world order. The world is changing rapidly and economies must adapt, argues Catts in Up on America. From past problems that were physical such as infrastructure, health care and social services, Catts feels that America is now focused on the more intellectual challenges of lifespan issues, financial structures and international trade. Catts goes on to note that all countries will need to adjust and adapt to this new fast-paced world of calculation, communication and innovation. He argues that to improve the economic structure of the United States, specific sectors like education, agriculture, biotechnology, nanotechnology, entrepreneurship and small businesses should be offered incentives so that they may grow and flourish. Since market economies adjust more quickly to change, Catts believes this is one of America’s true advantages. He suggests that with the largest foreign-born population in the world, immigration is the most important growth characteristic of the U.S. economy as compared to many other developed nations. A contemporary, current events analysis of the state of the world, the United States’ role in that world and the trends that place America at the forefront of the world order, Up On America aims to be a positive look at America’s ability to innovate, lead and add value to every market sector. Meant for the average American investing in the world today and for financial advisors to give to their clients as an educational tool, Up On America is designed to be as optimistic as it is insightful.